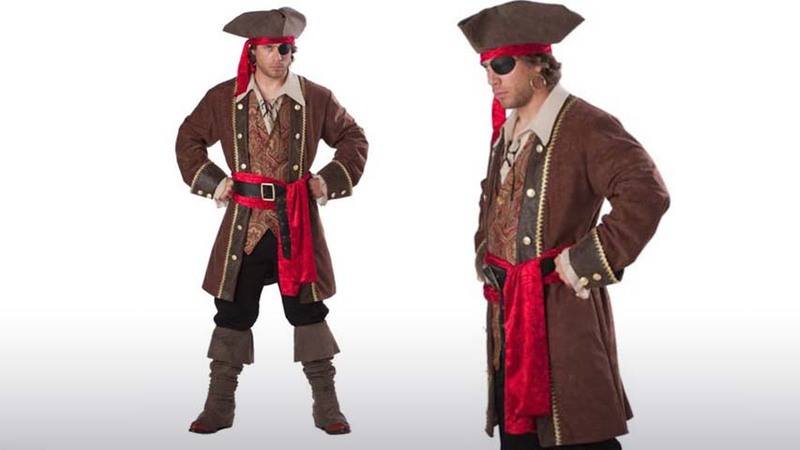 Everybody knows that the surest sign of an able seaman is the ability to sound particularly pirate-y in everyday speech. And since this incredibly detailed costume is made for only the saltiest of dogs, we tried to give it a name that would sound at least half as swashbuckling as it will make you look—but that's a pretty tough coconut to crack! 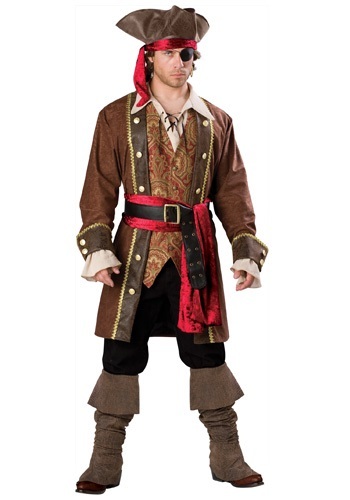 We had almost settled for Lieutenant Duplicity when our pirate expert kicked down the conference room door, stinking of fish and rum, with a flintlock pistol in each hand and a dagger clenched in his teeth. Fghfhg Fghfghfghfgh, he said. And after removing the knife from between his chompers, we discovered that he was hell-bent on naming this outfit after Captain Skullduggery instead! Recognizing that we were in the presence of a gifted pirate-talker, we immediately ceded to his demands. When you're dealing with the genuine arrrticle, that's pretty much business as usual. So if you want to harness the persuasive power of a prominent privateer, practice some seaworthy sailor slang. And it doesn't hurt to wear a dashing ensemble like this, either! The multi-part combo includes everything you need to look like a proficient parlayer, from the tips of your tricorn hat to the points of your faux-leather boot covers. The exquisite designs on the long coat and vest will lend your words an air of antique authority, and the whole outfit is designed to cut down on the time it takes to suit up, so you can set sail ASAP!